A vintage and chic crossbody bag can be with you when you go to school, work or have a trip. This crossbody bag shows its large capacity in multi pockets. Chic, durable, convenient and versatile, this is just the bag you need. Made from fine canvas fabric, durable for daily use. Canvas with PU leather brim, vintage and chic. Flap with buckle closure and one zipper pocket and two pouch pockets. Two side pockets with buckle closure and one zipper back pocket. Interior compartment, one interior zipper pocket and two slot pockets. 3. 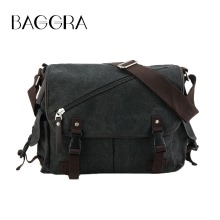 This listing is for one bag only, mobile phone and other accessories (if any) are not included. 4. Lining color will be sent at random.